A historian vividly reconstructs Eastern Europe as a place of Jewish life rather than of Jewish death… Eastern Europe has a Jewish history, and Jews have an eastern European history. The most important country in early modern Jewish history is one that few Jews can name: the Polish-Lithuanian Commonwealth. As Jews were expelled from western and central Europe between 1300 and 1500, they were welcomed in Polish lands. In 1569, the Polish kingdom joined the Grand Duchy of Lithuania to form this new constitutional union. As a result of this change, the Polish part of the new entity took from its Lithuanian partner the lands known as Ukraine. The Polish colonization of Ukraine in the 16th and 17th centuries permitted the emergence of a certain synthesis between Polish landowners and their Jewish clients, who helped them turn their property into profitable estates. It was in these conditions that the "shtetl" emerged: a private town owned by a Polish nobleman, distant from royal authority, with a Jewish-majority population generally permitted to manage its own affairs. In history, as opposed to memory, these were usually stable sites of Jewish communal life, places where the major trends in Jewish religious thought and practice emerged in the centuries to come. Under the commonwealth, Jews experienced what Mr. Polonsky calls a "sense of security." The political system of the commonwealth was a kind of aristocratic republic, in which nobles formed the legislature and elected their king. This marginalized the two estates that had the most obvious interest in discriminating against Jews: the Christian burghers of the cities and the Roman Catholic Church. For the landed nobles the suppression of the cities and the humiliation of the church were often points of pride. As Mr. Polonsky authoritatively records in "The Jews in Poland and Rus–sia," Jewish communal autonomy became an integral part of the Polish political system. Jews appointed their own rabbis and communal authorities and collected their own taxes, for their own communities and for the state. The assignation and collection of taxes meant an organized relationship, through Jewish councils, with the highest authorities of the commonwealth. Jews suffered when the Commonwealth suffered, as in 1648, when some 13,000 Jews were killed during Bohdan Khmelnyts’kyi’s Cossack rebellion against the Polish colonization of Ukraine. 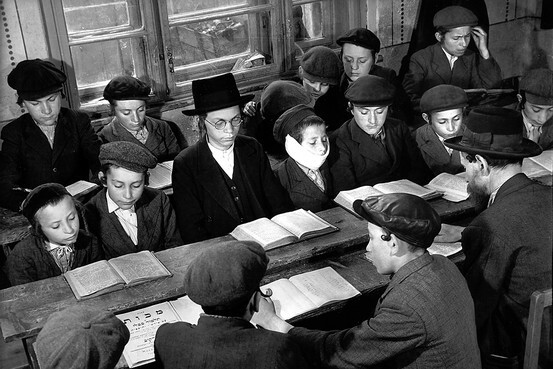 Young men study the Talmud in Uzhorod, now Ukraine, in 1937. The city, then part of Czechoslovakia’s Ruthenia province, was a center of Hasidism and traditional religious study. Uzhorod’s Jews were rounded up and transported to Auschwitz shortly after Passover in 1944. The great problem for Jews in the commonwealth was the transformation of a regime of early modern communal toleration into a modern regime of individual liberty. The arrangement between the Jews and the Polish state—in effect, taxes and commercial services in exchange for religious freedom and local autonomy—only worked so long as the state was too weak to reach the individual. As states centralize, they dispense with traditional mediators, such as Jewish communal authorities, and begin to draft and tax individuals. In a liberal state, this individual is a citizen, who in exchange for this new treatment receives individual rights, which protect the citizen against both the state itself and the previously dominant religious elders. This process of emancipation in the Polish-Lithuanian Commonwealth, as Mr. Polonsky presents it, was a delicate political negotiation rather than some inevitable outcome of progressive human liberation. In the best of circumstances, wise leaders of a strong state would prepare members of minorities for the new arrangement by creating institutions that both preserved religious distinctiveness and allowed for social integration. As Mr. Polonsky chronicles, more or less the opposite happened in the commonwealth. The Polish-Lithuanian state weakened in the 18th century, as a result of the perversion of parliament by the wealthy aristocrats and by the incursions of the neighboring Russian, Habsburg and Prussian empires. This left Jewish communities facing two transitions at the same time: into foreign rule, and into modernity. This was the epoch of the development and spread of Hasidism among Jews. 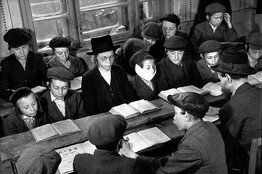 The Hasidim were, in one way, no more than an expression of the traditional respect for religious piety. They were scholars in communities where learning was respected. But they offered a broader experience of religiosity, with a more accessible idea of the relationship between knowledge of texts and experience of holiness. Even women, normally excluded from the learning of Hebrew and Aramaic, the languages of learning, could sometimes take part. The Hasidim were not political rebels, but their emphasis upon individual religious experience suited a time when traditional institutions were dying and new ones could not yet be born. "Jews," Mr. Polonsky writes, "were the only significant non-Christian group tolerated in Western Christendom, and they flourished in the Polish-Lithuanian Commonwealth." When the commonwealth was dismembered by its imperial neighbors between 1772 and 1795, most of its Jews fell under Russian rule. In a single blow, a state without Jews became the largest Jewish state in the world. In the far west of the Russian Empire, where Poles for a time enjoyed autonomy within a subordinate kingdom, some rebels and reformers sought to enlist Jews in the struggle for Polish liberation. But the steady suppression of Polish autonomy by Russian imperial institutions meant that modern Polish politics began in circumstances inauspicious for Jews. There was no Polish state that might have sponsored integrative policies, only revolutionary movements that sought to organize peasants and workers. In practice, this sometimes meant the mobilization of traditional Christian prejudices against Jews who now lacked traditional protection. In the rest of the Russian Empire, as Mr. Polonsky demonstrates, the situation was worse. The Russian Empire first perverted traditional communal institutions and then destroyed them, and the czars blamed Jews for the failure of their own policies. From the 1880s, Russian subjects killed Jews in pogroms, believing that they were doing the will of their rulers. The accusation of Jewish ritual murder, ridiculed by Polish rulers a century earlier, was believed by Russian czars and their advisers. In this environment the Hasidim flourished, while Jews generally came to see themselves as they were being seen, not only as members of a religion but as a people, a nation. Mr. Polonsky misses very few connections. One of the few links between his themes that he might have pursued is that between imperial Russian and modern German anti-Semitism. As the Russian Empire fell after the revolutions of 1917, its defenders—the commanders of the so-called Whites—presented the Jews as the enemies of Christianity and the backers of Bolshevism. Mr. Polonsky describes the modern anti-Semitism of the late Russian Empire but might have emphasized that the "Judeo-Bolshevik" idea, brought west by Russians and Baltic Germans after the Bolshevik victory in Russia’s civil wars, became an integral part of Hitler’s own vision. The Holocaust had something to do with this eastern European form of anti-Semitism. As Mr. Polonsky rightly notes, the Holocaust was a product not only of German ideas but also of German wars. Poland, independent again after 1918, was home to some three million Jews; it was invaded in 1939. The Soviet Union, home to four million more, was invaded in 1941. By the autumn of that year the traditional Jewish homeland was under the rule of a single state for the first time since the destruction of the old Polish-Lithuanian Commonwealth. That state was Nazi Germany. Mr. Polonsky, as much as anyone else, has created the field of modern Jewish history as a subject to be considered and understood rather than simply a tragic past to be mourned. He is too good a historian to confuse the history of Jewish life with the German policies that brought Jewish death. Though he sees interwar Poland as politically incapable of integrating Jews, he presents Jewish accomplishment in the professions and culture with the bravura it deserves. The Soviet Union had provided Jews with something that they had never before known, the possibility of individual assimilation, but at the price of the total renunciation of traditional life, including religion. Usually we read of the Holocaust as a matter of German policy, with the Jewish victims appearing just before, or even just as, they are killed. The Holocaust figures in the last volume of Mr. Polonsky’s exemplary study as a Jewish experience, because Mr. Polonsky has already established all the Jewish geographical, social and even literary references. After 2,500 or so pages, the reader’s sense of this Jewish world is vivid, deep and rich. The world that is lost is real. Mr. Polonsky’s account of the Holocaust resounds because death is ceaselessly visited upon individuals whose individual Jewish commitments, fears and hopes we can feel that we understand, thanks to Mr. Polonsky. We understand Jewish responses to the Holocaust better because we understand the world before the Holocaust. The Holocaust in Mr. Polonsky’s telling is not part of any historical logic, no lesson that Jews had to learn. Its bottomless reality, as Mr. Polonsky shows, is worse and truer than any story that can be told about it. Mr. Polonsky’s tender skepticism of myth and memory allows him to complement the story that many readers will want, that of armed Jewish resistance to the Holocaust with the ones that are less familiar but perhaps more characteristic. As Mr. Polonsky does not forget, many Jewish fathers did not fight because they would not leave their families. What of the father, he asks us, who accompanies his son to the shooting pit in order to point to the sky and avert his son’s eyes just before the bullets come? These are the realms of emotion that reduce many historians to personal attacks and political posturing; Mr. Polonsky is entirely free of both. The barely visible commitment in these three wonderful volumes is to rescue a world from polemic, for the sake of history. Generation to generation, memory is about what we choose to record. Eastern Europe has a Jewish history, and Jews have an eastern European history. In bringing the peoples together, Mr. Polonsky is making no simple attempt at national reconciliation and pays no homage to stereotypes or taboos. With gentle persistence he records catastrophe, but also, despite everything, continuity—between the old world of Poland and the new world of Israel and America. What he has produced is a grand history in the old 19th-century style, a result all the more remarkable because he cannot have the confidence in progress that historians of that age possessed, and all the more erudite because he uses the most recent literature from the region as well as from North America and Israel. By the end, after 1945, literature replaces life a bit in Mr. Polonsky’s account, as the Jewish survivors of eastern Europe themselves turn to recording of catastrophe and then to the mood of nostalgia. Here especially he is a sure guide: When he pauses to praise or translate the extraordinary Polish-language poet Julian Tuwim (1894–1953) or the grand modernist novelist Der Nister (1884–1950), you know you are being introduced to writing that is not only representative but excellent. The writers, like the historian who records and interprets, must lose confidence when confronted with the 20th century. But the best of them, like Antony Polonsky himself, work on to give shape to the shapelessness and sense to the senselessness. They enable, in the deepest sense of the word, memory. —Mr. Snyder is Housum Professor of History at Yale and the author of "Bloodlands: Europe Between Hitler and Stalin." A version of this article appeared May 19, 2012, on page C5 in the U.S. edition of The Wall Street Journal, with the headline: Their Sense of Belonging. This entry was posted in Education, Judaism, Recent Posts. Bookmark the permalink.